Lewis Hamilton is doing me a favour. Every now and again I get into an argument with Mark Hughes - well, let's call it a spirited discussion. It's about who was quicker/better, Gilles Villeneuve or Ayrton Senna. In keeping with half the world I was a huge fan of both, but happen to think that Ayrton was superior. Mark is in Gilles' corner. It's true that Gilles never got himself into a proper car until 1982, the year he died. He did some wonderful things with Ferrari's 312T4 in 1979 but by then the Scuderia, hamstrung by the dimensions of its flat 12 boxer engine, was fighting an unequal struggle against an ever-expanding portfolio of 'wing' cars. Poor Villeneuve had just four full seasons at the top level and results are no way to judge him. One of my lines of attack is that no way, not in a month of Sundays, would Ayrton have been outqualified 12-4 by Carlos Reutemann in his first season of F1, as Gilles was. You're probably a bit lost there. It's a reference to Frank Bradley, who once beat Senna in an FF2000 race at Snetterton. Bradley was a competent racer not a real front-runner, who used to turn up in a Lamborghini Countach, registration FJB1. Obviously a good business, cockles and mussels. There's a funny story about the Countach which, I suspect, might just be apocryphal. One day an Essex hood nicked it and, showing off, drove to his local boozer. But as luck would have it, among the clientele were a couple of Bradley's friends. One of them said: 'Oh dear, you know what you've done? You've just been for a joy ride in Frank Bruno's Lambo! And he's due in here anytime now.' Exit thief, pronto, leaving the keys on the bar. The point is, stories about Ayrton's conqueror that July '82 day tend to surround his off-track exploits rather than anything he did on the circuit, with all due respect to Frank, who's a top bloke. But, pulling the anorak on a quarter of a century later, let's just set the record straight. Yes, it did happen, but it was a wet, drying track and everyone save Bradley went to the grid on wets. As the dry line emerged, Frank came storming through and took the lead on the last lap as Ayrton ran out of grip at Sear corner. Frank loved it and even Ayrton thought it was funny. Allegedly. Hamilton's exploits thus far, described by triple champion Niki Lauda as the most impressive F1 baptism he's ever seen, have started people wondering just how good Lewis might be. Could he be a Senna or Villeneuve? Or, whisper it, even better? If you look at Villeneuve's first full season with Ferrari, alongside Reutemann, the bald facts are that Carlos won three races and Gilles won one, fittingly enough the season finale in his native Montreal. And, as I've said, the qualifying score was 12-4 in Reutemann's favour. Carlos finished the season third in the championship to the Lotus drivers, with 48 points, while Gilles was equal ninth, with 18. Two of the four times in which Gilles did the better qualifying job came in the season's last three races, by which time it was known that Reutemann was on his way to Lotus and had probably lost interest. The Hughes line is that you can make stats prove pretty much what you like but that when you look beyond them, Villeneuve's performance was mighty impressive. For instance the average qualifying gap between Carlos and Gilles over the year amounted to just 0.19s and some of the French-Canadian's race performances were stunning. 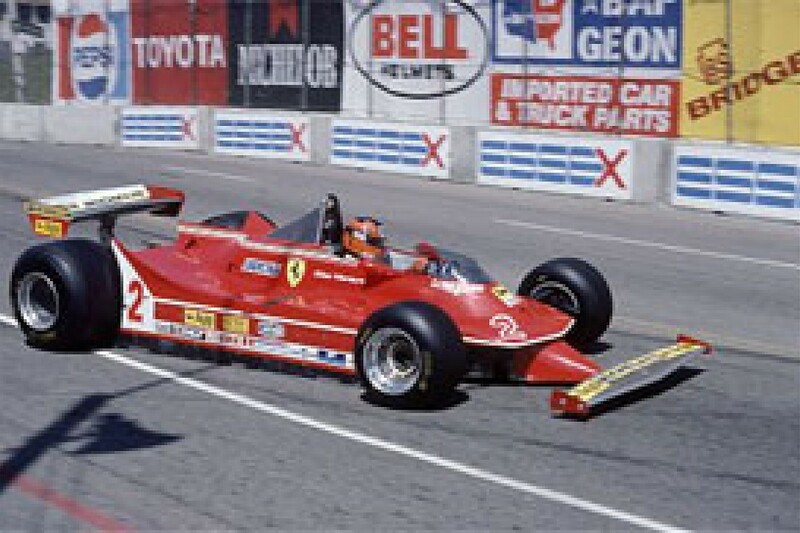 Look at Long Beach, race four, he'll say, when Gilles led convincingly before Reutemann inherited the win. Which is where, playing devil's advocate, you chime in that it would have been better if Gilles hadn't driven over Clay Regazzoni's head (Villeneuve's Ferrari tangled terminally with Clay's Shadow while lapping him, leaving a tyre mark on Regga's crash helmet!). Admittedly, you can't legitimately claim that Ayrton definitely wouldn't have done likewise because you know that patience was never one of the Brazilian's virtues either, and something in the back of your mind recalls him taking off his nose lapping Satoru Nakajima while under no undue pressure. Then there was Villeneuve's spirited pursuit of Mario Andretti's superior Lotus 79 in Belgium, the 34 laps he headed Andretti at Monza before both were hit with one-minute penalties for jump starts, the podium in the wet in Austria and the win in Montreal. That win in Gilles' first full year was the first time the feat had been achieved for a decade, since Jacky Ickx won the French GP at Rouen in 1968. And it had been done in a car that, clearly, was not the best in the field. Since then, of course, Gilles' own son won four times in his debut season with Williams in '96 but, frankly, plug a monkey into a an early/mid nineties Williams and it would have won races. These things are largely meaningless. Lewis Hamilton obviously has the ability to win races in '07 if the cards fall for him. But whether he does or doesn't is largely irrelevant to the bigger picture. You can't draw too much from a driver's first year unless there is a decent teammate yardstick as, obviously, there is for Hamilton and, to a lesser extent, there was for Villeneuve. Ayrton replaced Derek Warwick at Toleman 1984 and was alongside Venezuelan motorbike ace, Johnny Cecotto. Cecotto won the 350cc world title in his first season of bike racing and, at 20, was the youngest ever winner of the Daytona 200. He then had a sizeable shunt which put him out for a season and, when he returned, Kenny Roberts' star was in the ascendancy. Cecotto switched to four wheels and did a decent enough job in F2, tying on points with works March team mate Corrado Fabi in 1982 but losing out on dropped scores. He learned the F1 ropes alongside Derek Warwick at Toleman in '83, scoring a point at Long Beach, but had his mind blown by Senna's arrival the next year. First time out in Brazil, Senna outqualified Cecotto by 1.8s. Senna and Martin Brundle were both F1 debutants that year, with the British F3 title going down to the wire between the pair of them the previous season. Brundle says: "In that first GP in Brazil we had an agreement not to hold each other up if one of us was quicker. Needless to say that went out of the window and Ayrton was all over the road trying to keep me behind when he got a better start! And he had me on the grass going down to the first corner..."
Cecotto was a lamb to the slaughter. For round two in South Africa the qualifying gap was 1.3s and Senna, pretty much immediately, was de facto team leader. Cecotto then suffered a heavy accident in practice at Brands Hatch, and his ankle injuries finished his F1 career. You have to feel a bit sorry for him. Kenny Roberts to cope with on two wheels and Ayrton Senna on four! Unlucky, son. I will always contend that had Senna had his first season in one of the dominant '84 McLarens against Prost, more than likely he would have won the championship. Even in year one. As it was, Ayrton arguably cost Alain that title. At Monaco, in the wet, his Toleman was catching Alain's leading McLaren hand over fist. Realising he was being reeled in, Prost started gesticulating about worsening rain and clerk of the course Jacky Ickx brought the race to a premature halt with Ayrton right on Alain's gearbox. I am now using Lewis's performances this year as further vindication of my belief that Senna was good enough to challenge even a driver of Prost's calibre for the title first time up, and that he would certainly have seen off Reutemann. Mark's counter argument is that you can't compare Senna's first year with Villeneuve's because Gilles had only raced a car for the first time four years before and only had one decent season of Formula Atlantic (when he blew off James Hunt at Trois Rivieres) before he found himself in a McLaren at Silverstone in '77. Senna, he argues, has been racing since he was practically out of nappies. 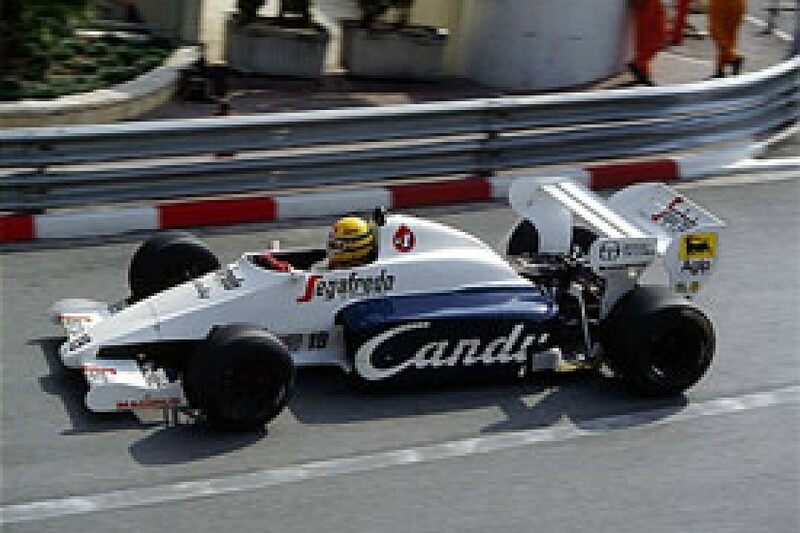 But Senna, too, only had three seasons in cars before he arrived at Toleman. My only reservation over that first season would have been whether his fitness would have allowed him to take on Prost. He quickly trained himself when he realised the importance of physical conditioning, but in a front-running car from the outset it may have been an issue. Still, I doubt it. Mind can overcome matter and there was nobody so intensely driven. Was karting, necessarily, so much better preparation than snowmobiling? Not if Villeneuve's car control is any barometer. Anyhow, chewing the fat never fails to while away a couple of hours. What Hamilton has proved beyond doubt is that if the talent level is there, and the preparation and attitude, F1 inexperience is no barrier to success. You've still got a wheel and a couple of pedals no matter what the category or opposition. The constant testing obviously helps - it didn't used to be so intensive - but something Jarno Trulli said recently made me think. Talking about the banning of traction control, Jarno said: "I'm all for giving as much as possible back to the driver. It's too easy for a novice to drive an F1 car at the moment. Increasingly it's about fine-tuning a set-up to have a tenth's advantage over your team mate." When you look at the gaps up and down the grid, there seems to be something in what Jarno says. Make it tougher, with much more power than grip, and that would make it harder for the new boys. But, I think, not so as you'd notice. There's nothing to suggest that the need to self-modulate the throttle would be any more hindrance to a Hamilton than it was to a Senna or Villeneuve. Quite the opposite, in fact. No, as far as I'm concerned, if you've got it, you've got it.